assembly88, a store selling upscale men’s fashions, will hold its grand opening Monday at 544 Hamilton St. in Allentown. The shop, which is the first retail business to open in center city’s arena zone since the PPL Center’s debut in September, will celebrate its opening by hosting “First Monday,” a monthly networking and happy hour event from 5-7 p.m. The event is sponsored by the Hamilton District Main Street Program and the Allentown Chamber of Commerce. Aimed at “the discerning man who wants to look good both on and off the job,” assembly88 will feature clothing, shoe and accessory lines not typically available in most mall stores, says co-owner Santo Napoli, who has also operated two young men’s clothing stores – The Archive and New York Urban — on Hamilton Street for almost 15 years. “There were a couple factors that led me to open assembly88…,” Napoli said. “First, while the existing stores are doing great, I am getting older and I wanted to offer something to customers that I can also relate to, and second, the renaissance in downtown Allentown has brought a whole new class of customers to the city and they need to be served, as well.” Napoli, who earned his business degree from Alvernia University, and his brother and co-owner, Giuseppe, learned the menswear business on the streets of Reading and Allentown where their innovative retail savvy made them successful in locations that others dared not go. Clothing lines will range from well-known brands such as Levi’s to upscale lines such as Adriano Goldschmied, J Brand denim, Tommy Bahama and Robert Graham. 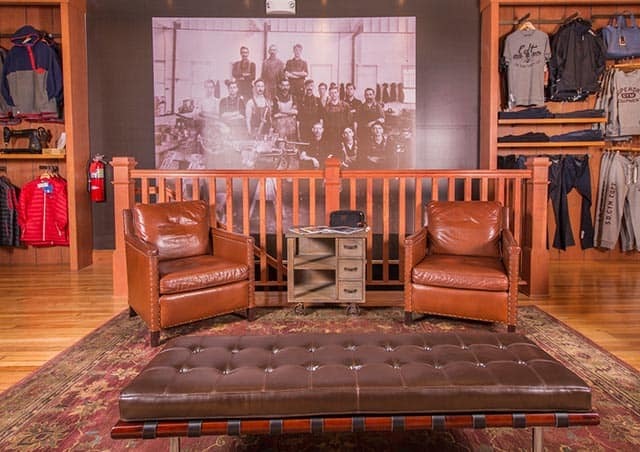 Accessory brands will include Filson and Will Leather Co. and shoe lines will include names such as Cole Haan, Johnston & Murphy 1850, Sperry and Red Wing Heritage. The name, décor and atmosphere of assembly88 are designed to hearken back to Allentown’s manufacturing heritage. The store, located just about halfway between the old Mack 4A plant in south Allentown and the former Neuweiler Brewery on Front Street, features a restored tin ceiling, the original 1887 floor, exposed brick walls and photos that will illustrate the plants and mills that made the city an industrial powerhouse for most of the 20th century. The name itself is a tribute to Kramer’s Music House, the space’s original occupant, and the number of keys on the pianos that were built and sold there. Assembly88 joins a host of new restaurants, including Roar Social House and Chickie’s & Pete’s, that have opened in a four-block stretch of Hamilton Street in the wake of the arena. Hours for assembly88 will be 10 a.m.-7 p.m. Monday through Thursday and 10 a.m.-8 p.m. Friday and Saturday. Info: Assembly88 on Facebook.